Benedict said his mystical experience had lasted months, building his desire to create a direct and exclusive relationship with God. Now, after witnessing the “charisma” of his successor, Pope Francis, Benedict said he understood to a greater extent how his stepping aside was the “will of God”. Benedict’s reported remarks contrast with the explanation he gave to cardinals when he announced his resignation on 11 February. “My strengths, due to an advanced age, are no longer suited to an adequate exercise of the Petrine ministry,” he said then. At the time, a German journalist who had recently met Benedict reported he was going deaf, appeared to be blind in one eye, and was emaciated and “exhausted-looking”. Zenit reported that Benedict has stuck to his plan to live a life of secluded prayer, receiving very few visitors at his house in the Vatican’s gardens, which enjoys views across Rome to the Apennine mountains beyond. “During these meetings, the ex-pontiff does not comment, does not reveal secrets, does not make statements that could be understood as ‘the words of the other pope’, but is as reserved as he has always been,” wrote Zenit. After concerns were raised that Benedict would exert undue influence at the Vatican as his successor struggled to find his feet, Francis’s popular approach and his shakeup of Vatican protocols have relegated Benedict to the sidelines. 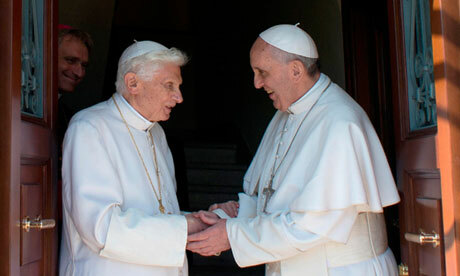 Having Benedict living in the Vatican, he added, “is like having a grandfather – a wise grandfather – living at home”. Francis’s first encyclical, issued in July, was started by Benedict while he was in office and finished by his successor.